As flood lights are so widely used in different applications, there are also certain floodlight types suitable for different purposes. Flood lights can be divided by their usage and by portability. In this article I have categorized the most common flood light types taking in account portability of the light. Wired flood lights are the most used type of flood lights. Wired flood lights are usually referred as regular flood lights. Wired means that flood light needs to be wired to some sort of outer electrical power source in order to function. Usually this means wiring light to a junction box or another electricity outlet. Some flood lights come prewired and just need to be plugged into an electrical socket. But usually you will need to wire floodlight yourself. Always remember to turn off electricity before you start working with flood light wires! 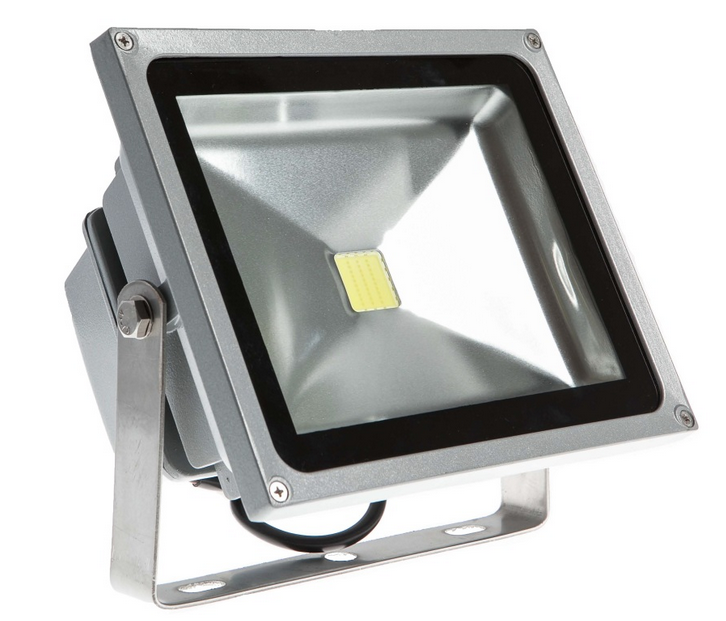 Wired flood lights are used in places, where large amount of light is required. Portable flood lights cannot provide same amount of light as wired flood lights, because they simply run out of juice after couple of minutes. You will find these lights in a place, where multiple flood lights are used together to provide more powerful light like, for example, in stadiums, arenas and other large areas. As mentioned above, the advantage of wired flood light is much larger amount of lightning they can provide. However, wired lights have some disadvantages compared to portable lights. First, the word ‘’wired’’ means, that once you set the light in its place, it will probably stay there for rest of its life. It’s quite a hassle to regularly reinstall wired flood light into different place, which is why portable lamps are used for these occasions. Wired lamps also consume more energy than, for example, solar flood lights. In summary, wired flood lights are good in places, where large amount of lighting is required, but consumes more energy and is harder to install and requires a lot more work to reinstall into a different place. 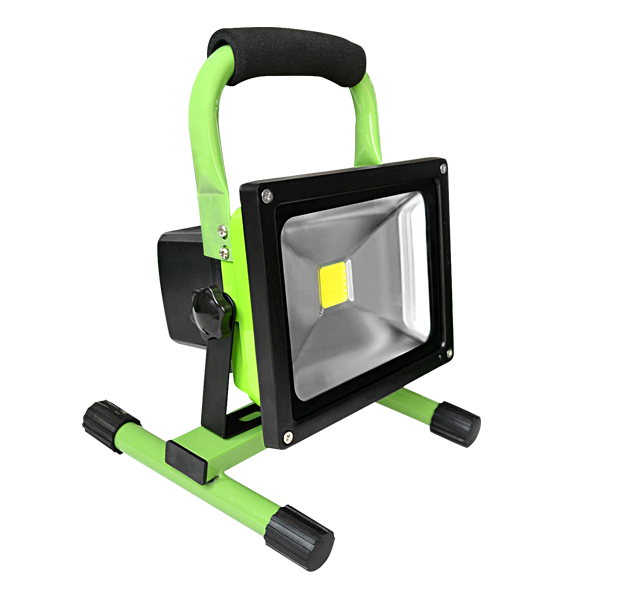 Portable flood light is the next most used type of flood light after wired light. The word „portable” says that this type of fixture does not need to be wired to electricity outlet. But portable does not mean that there will not be any wires at all. Portable lights use built in batteries to power the light. And these batteries need to be charger externally, usually with electrical cable that gets plugged into electricity socket or with solar panel used in solar flood lights that collects sun energy and transfers it into electricity that gets stored into floodlights internal or external battery. There are multiple types of batteries used in portable lights, from smaller Ni-CD and Ni-MH AA and AAA type batteries, to large Lead-Acid batteries and different types of Lithium batteries. Which battery is used in portable flood light depends on the type of fixture. Smaller and cheaper lamps use rechargeable AA or similar batteries, while high intensity floodlights are equipped with large lithium or acid batteries. Portable flood light usage is practically unlimited. They are used in places without direct electricity source, where large amount of lighting is needed. Portable flood lights can work like huge-sized flashlights. The advantage of these lighting fixtures is that they can be used practically anywhere thanks to their rechargeable batteries. If we talk about disadvantages, portable flood lights are less powerful than wired flood light. Portable lights with larger level of brightness and power require battery with lot bigger capacity, which partially reduces portability of the light. Also, it’s well known that batteries wear out after some time. This means that after few years of regular usage (depending on the type of battery) battery will not be able to provide same amount of work time and will need to be replaced. This situation will not happen with wired flood lights. In summary, portable flood lights are great for all sorts of usage, as they work on their own batteries. Portable flood lights have a lot of different sizes and level of power, depending on the usage of the light. The advantage of portable fixtures is that they can provide light in areas, where wired lights cannot work. However, the amount of light power and work time of portable light is pretty limited to the size of the lighting fixture and battery capacity. 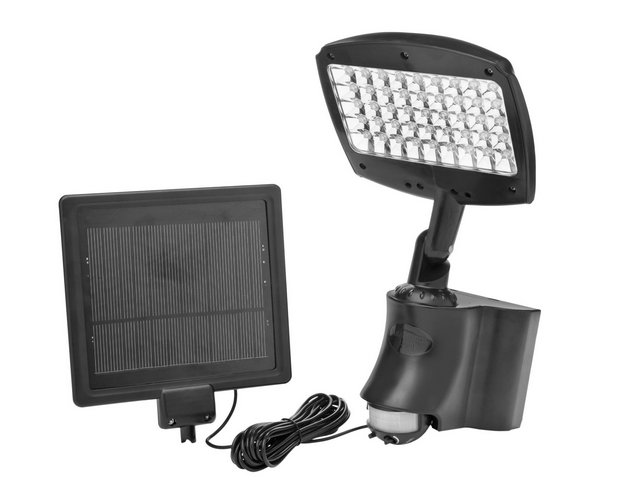 Solar flood lights are the most popular type of portable flood lights. In recent years different solar products have become more and more common and can be found not only in commercial but also in individual properties. Sun energy is alternative energy source, which means that it renews itself. The best part of solar energy is that it’s free for everyone to use. The only thing you need is a solar panel. Of course, large solar panels used on rooftops of houses currently cost a lot, but much smaller solar panels used to charge flood light batteries are a lot cheaper. Solar flood lights in opposite to other portable or wired flood lights, which needs direct electrical source to charge or power the light, uses their own power source – sun. These flood lights have an external or internal solar panel. Solar panel is usually attached to lighting fixture with couple feet long cable. Solar panel needs to be placed in area, where direct sunlight can reach the panel. Solar panel collects sun energy and charges battery that is built into the lighting fixture. Later at night, flood light can illuminate by using energy collected and stored into the battery throughout the day. Solar flood lights, similar to other portable flood lights, comes in many different sizes, with lighting outputs from couple watts to more than hundred watts and work times from under an hour to whole night. The most common place to use solar flood lights is around the house. Some popular ways to use solar flood lights are – as front door light, as shed or garage front light, driveway or walkway light, garden and backyard light. More and more people use solar lights in their houses, because of non-existing electricity costs. Solar lights are more expensive than wired or regular portable lights, but in long term can pay themselves off even multiple times. From positive side, solar flood lights can provide same portability as other portable flood lights. These lights are a lot more economical and you will not have to pay for electricity, while using them. Disadvantage of solar flood lights are the possible lifetime of a fixture. Solar panel, same as battery, wears out after some years of usage, so you may need to replace these parts in the future. However, this time can be form couple of years to more than 10 years, depending on the quality of your solar light. Hybrid flood lights are the less known type of flood lights. Hybrid means that lamp can act both as wired and portable light. Hybrid lights can be wired to electrical socket same as wired flood lights and they have built in battery, so they can also work when wired electrical source cannot provide electricity to the fixture. Hybrid flood lights are used lot less than portable or wired lights. Usually hybrid lights are used in places with unstable direct electricity sources, so in situation, where there is disruption of electricity, lamp can still provide lighting for certain amount of time. 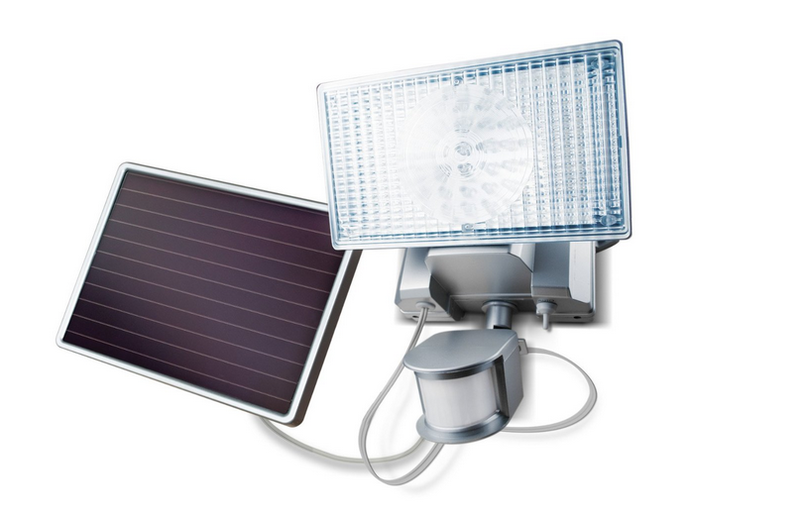 Hybrid flood lights are also often used together with solar panels. This is actually a pretty useful combination, because most solar lights cannot illuminate all night long. So, if you need a solar light that can illuminate from dusk till dawn, you will probably have to buy a high capacity solar light for couple hundred bucks or use a wired flood light that will consume a lot of electricity. In this situation, hybrid flood light would be the best solution, because it can charge the battery with solar panel during daytime and use the charge to power flood light at night. And when battery runs out of juice, the light can continue to illuminate using wired electricity source. One the plus side, hybrid flood light is able to provide the same features as wired flood light, but at the same time save more energy when used together with solar. Hybrid light can also provide lighting in situation, when there is a power outage. The disadvantage and why this type of floodlight is not really popular is that mostly people need a wired or a portable flood light and not something between. Hybrid flood lights are not fully portable and still need to be wired to electrical outlet and they cost a lot more than regular floodlights. In summary, hybrid flood lights can be wired to electrical outlet like regular flood lights and they also have a built in battery like portable flood lights. They are great in areas, where there are many power outages and it’s crucial to have some sort of lighting in such situations. And hybrid flood lights can be more economical than wired flood lights, if they use solar panel for battery charging. These are four most popular types of flood lights you will find on the market. Each of these flood lights is suited for different areas and situations. Before purchasing a flood light consider, which type of fixture is more suited for your needs. If you have any additional information, questions and suggestions, feel free to contact us directly from contact page or leave your comment in the comments section. This is awesome post! Thanks for sharing helpful info about flood lights.